Set based design (SBD) or set based concurrent engineering (SBCE) as it is also known is a powerful lean engineering method. Firms that design complex systems should consider this approach to deliver better designs more efficiently. A caution though that this is an advanced lean engineering method so is not appropriate for new design organizations. Set based design builds on concurrent engineering principles (multifunctional, co-located team design) by establishing a design space for design optimization to meet a challenging set of requirements. Set based design involves exploring many design alternatives up-front to allow for trade-offs particularly important for integrated systems with competing requirements. Set based design improves on ‘point design’ with its’ many shortfalls – fixation on first design selected, time delay before feedback, and locked in cost too early in the design process. The differences between point design and set based design can be best understood visually. 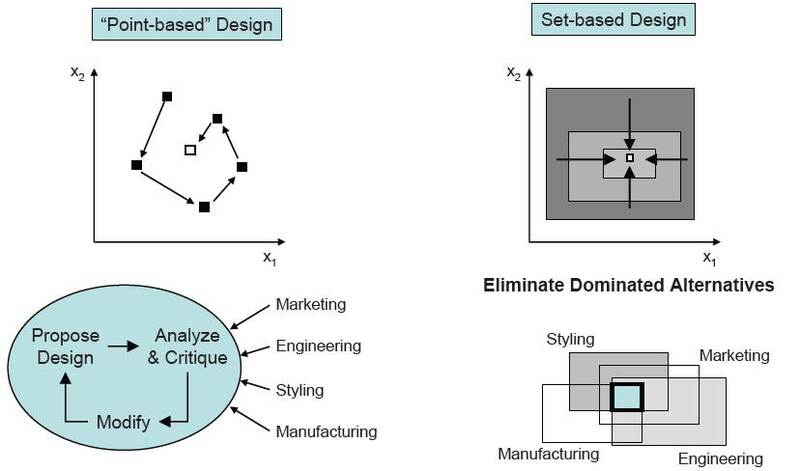 A key principle underlying set based design involves delaying design decision later in the design process to achieve optimal trade-offs by eliminating inferior or sub-optimal design alternatives. Although counter intuitive while the design decisions are delayed set based design involves front end loading the design stages of the project to develop the design alternatives. The front end loading facilitates early learning, early identification of risks, and early mitigation of risks. A key success factor is the discipline to identify all possible design alternatives up-front without allowing the design to move on with a favourite alternative – creativity, innovation, and practicality under pin this step. Set based design was originally developed by Toyota within the Toyota Production System but not as well advertised as lean manufacturing. Set based design has been studied since the 1990s but is mainly applied in OEMs. Adopters have mainly begun their lean engineering journey and are exploring advanced improvement techniques. Set based design has been applied in automotive, ship building, EPC, and aerospace. Moving forward the main challenge to implementation is establishing practical procedures. Most firms establish unique digital or hybrid manual/digital design spaces to handle product design of varying complexity. We are at the stage where a high degree of customization is required to adapt the principles to new product development. This entry was posted in Lean Engineering on June 7, 2013 by Andrew Reif.